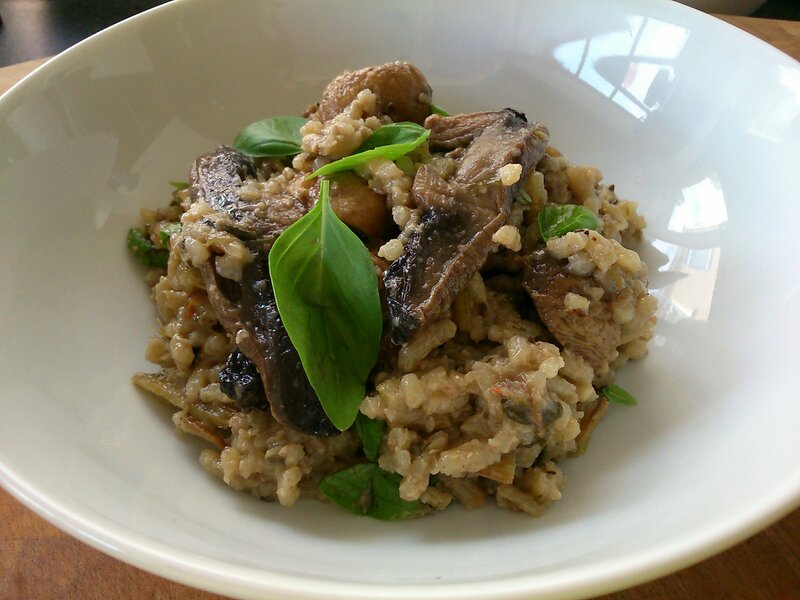 I do love a mushroom risotto. Of course there’s no butter or cheese in a vegan version, but that means that we don’t rely on dairy to add richness! Instead the flavours are layered with delicious seasonings and herbs, with the rice itself giving the creamy texture and flavour. The resulting risotto has a lovely depth of flavour, and roasting the vegetables first really helps with this. Here I’ve chosen to bake the risotto rather than using the stirring method, it works very well as long as the water is hot when you mix it with the rice. In a large roasting tray, toss the celery with the oil, and a little salt and pepper. Roast for 25 minutes. Add the mushrooms (stirring them around in the oil), and roast for a further 20 minutes, turning once. 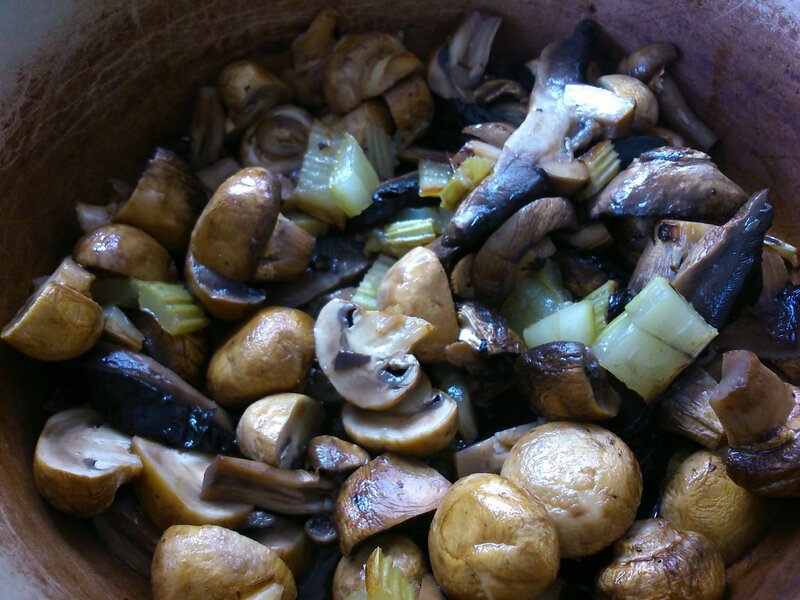 After this time the celery should be browned and the mushrooms cooked through and wrinkly and concentrated in flavour. Turn the oven down to 170. Cool the vegetables a little and then slice the celery and flat mushrooms, and halve or quarter the white mushrooms. Leave a few whole if they’re small. Tip the roasting pan juices into a large ovenproof casserole pan on a medium heat. Add the vegetables, and vermouth, and bubble for two minutes. Add the rice, and stir to coat. Next, add the oregano, mushroom and fennel powder, sun dried tomatoes, spinach, nutritional yeast and 700 ml of the hot water to the pan. Mix well, bring to a simmer and then cover the pan and pop it into the oven for 20 minutes. Remove from the oven and stir the last 100 ml of hot water into the risotto. Cook for a further 15 minutes. By this point the liquid should have been absorbed, and the rice will be lovely and soft. Season with salt and pepper, and stir the basil through just before serving.